The City of Oakland plans to clamp down on drinking at the popular monthly street festival, but it promises to be an uphill battle. Some bars and liquor stores do double their normal business on First Fridays. A few months ago, Kim Nguyen realized she had a problem on her hands — except maybe it wasn't a problem, or at least it was the kind of problem every business owner dreams of having: Saigon Market, the narrow, cluttered convenience store that she runs along with her husband just north of the corner of Telegraph Avenue and 23rd Street, was absolutely overrun with customers. Or rather, it was overrun exactly one night a month: the first Friday, when the art walk and street fair of the same name descends on Uptown Oakland, its center right in front of her little store. These days, Nguyen said, the tiny market — which sells lotto tickets, soft drinks, fluorescent-colored snack foods, and, notably, a small selection of beer, wine, and malt liquor — brings in about $3,000 each First Friday — which is huge, considering that the vast majority of the store's products retail for only a few dollars, and the space itself has room for fewer than about ten people at a time. A few months ago, the store became so choked with bodies that Nguyen and her husband, fearing safety hazards, had to enlist their son to start acting as something of a bouncer, controlling the flow of people coming into the store. On Friday, February 1, a line stretched out from the tiny store's entrance and snaked down the block like that of a nightclub or trendy restaurant. Around 10:30 p.m., the wait to get into the liquor store was at least fifteen minutes, and the vast majority of exiting customers were clutching tall cans or forty-ounces. Of course, it's not just Nguyen, and it's not just liquor stores. Of the seven bar owners and managers who were interviewed for this story — representing Camber, Fauna, Flora, The Punchdown, Era Art Bar and Lounge, Kim's Backyard, Telegraph, and Plum Bar — all said First Fridays usually bring in the month's largest single-night traffic, sometimes by leaps and bounds. "It's our biggest day of the month, hands-down," said John McGee of Era. "It's like when the fair comes to town." 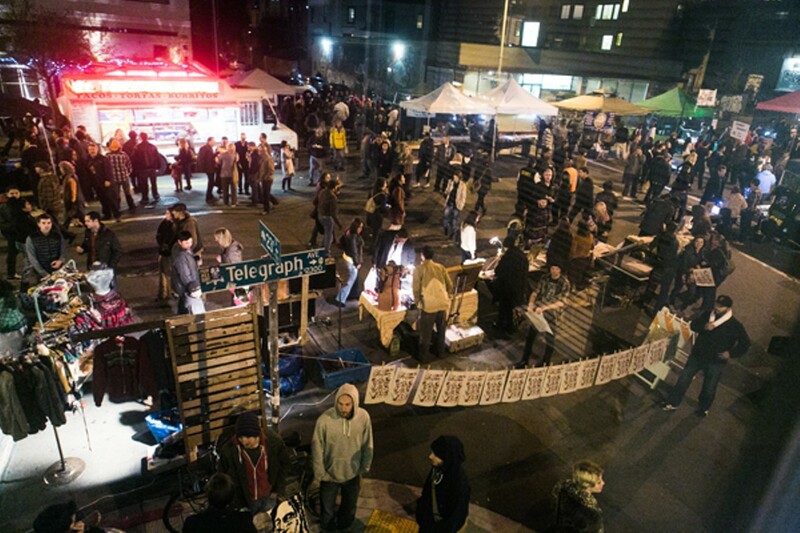 John Mardikian, who runs Telegraph, a beer garden at the corner of 23rd and Telegraph, said that a good First Friday can bring in about a week's worth of business in the space of just a few hours. Brick Loomis, service director for the Daniel Patterson group, said First Fridays see the normally mellow Plum Bar "packed like a nightclub" to the extent that he and a co-worker have been filling in as de-facto bouncers in order to manage the crowds. And according to Kim Rosselle, who manages the bars at both Flora and Fauna, located next door to each other at the corner of Telegraph and 18th Street, on a typical Friday night, Fauna usually brings in about $2,000 to $2,500 — but on First Fridays, it's more like $4,000. Between the two bar/restaurants, she said, receipts are "easily double." None of this should come as a particular shock to anyone who's spent any time at First Fridays over the last few months. But with the event under increasing scrutiny in the wake of a shooting at February's event that claimed the life of a high-school student, alcohol — both its ill effects and its economic impact — is at the crux of many of the arguments about First Fridays. One of the biggest and best arguments for First Friday is that it acts as both a direct and indirect economic driver, especially in a part of town that's only recently come to be known for its nightlife. "It's undeniable that First Fridays is an economic development initiative that the City of Oakland could never have done on its own," said Eric K. Arnold, a member of the First Fridays communication team and occasional Express contributor. But that good business has a flipside, especially when coupled with the sheer size of First Fridays, which now draw upwards of 15,000 people a month, as well as its general sense of unruliness. With at least five bars and three stores selling liquor within First Fridays' official footprint along Telegraph Avenue between 19th and 27th Streets — plus at least a dozen others within the surrounding blocks, and more in the works — all doing bang-up business, that's a lot of booze being bought and sold. And indeed, at any given First Friday, the brown bags and beer bottles are plain to see. All of which is compounded by the fact that unlike other street festivals, First Fridays happens at night, has no clear borders, and has historically been unregulated. "After public safety, I'd say alcohol is probably the second-biggest concern that's come up in the community meetings we've had, as well as in the more recent First Friday stakeholder meetings with city staff and officials," Arnold said. "It's just not sustainable to have people drinking in public with no regulation." It's impossible to tell which is the chicken and which is the egg in this situation, of course — that is, there's no way to know whether "drinking in public" is a symptom or a cause of "no regulation," or the other way around. But it's clear that people are concerned about both — though no one's necessarily found a way to solve either problem. 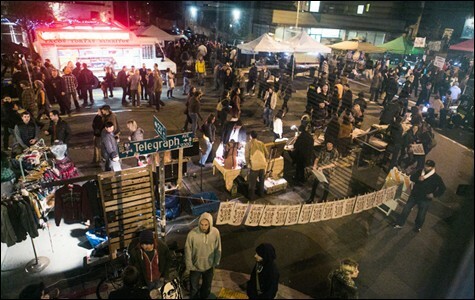 At the February First Friday, the City of Oakland set up its own beer gardens, ostensibly to allow officials to manage alcohol consumption better and more directly. According to a document released last week by Mayor Jean Quan's office in the wake of the shooting and the many community meetings that followed it, at the March 1 event, the city will "fully enforce a total ban on drinking in the streets." Arnold said that this would come in the form of police and security officers issuing citations for public drinking, as well as liquor store owners being prohibited from opening alcohol bottles for patrons. Arnold and other observers are optimistic that these measures will help, but he acknowledged that it's an uphill battle: "We want to de-emphasize the party aspect, but that's not going to happen overnight when it's been building up over six or seven years," he said. Bar owners can and do do their best to cut particularly drunk patrons off at the door or the bar, but that's a tough burden to shoulder when they're just trying to keep pace with the massive crush of customers. Likewise, liquor store owners can't reasonably be expected to refuse service to people — not to mention the fact that asking any of these businesses, most of which are mom-and-pop, to willfully serve fewer customers is unreasonable at best and unfair at worst. "I can't control what people consume on the street," said Mardikian. "I just can't." "It's a tough question," he continued. "Do I think alcohol causes some problems for some people? Yes. Do I think alcohol is the sole cause of the problems [at First Fridays]? No. Do I think public drinking should be facilitated? No. But do I think people should be able to sit somewhere and have a beer and some food if they're over 21? Yes. So it's tough."